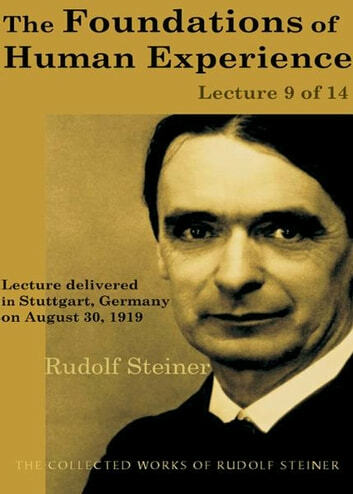 This lecture is part of the collection "The Foundations of Human Experience" by Rudolf Steiner. Steiner (1861-1925) was an Austrian philosopher, social reformer, architect, and esotericist. He gained initial recognition as a literary critic and cultural philosopher. At the beginning of the 20th century, he founded a spiritual movement, Anthroposophy. He is considered the father of Waldorf education, biodynamic agriculture, anthroposophical medicine and spiritual science. The first three seven-year periods of life. The three aspects of logical thinking: conclusion, judgment, concept. Healthy conclusions live only in completely awake aspects of life. The descent of judgment into the dreaming soul and concepts into the sleeping soul. Development of the habits of the soul through the type of judging. The effects of concepts which have descended into the sleeping soul upon the formation of the body, in particular the uniform common physiognomies. The necessity of living concepts: characterizations instead of definitions. Flexible and fixed concepts. The structure of a human idea. The childs unconscious basic tenor: 1) In the first seven years the world is moral, and therefore to be imitated; the impulse of the prenatal past. 2) In the second seven-year period, the world is beautiful; life in art, enjoyment of the present. 3) In the third seven-year period the world is true; systematic instruction and an impulse toward the future. The entire Collected Works of Rudolf Steiner are available from SteinerBooks.